In these pages, I wish to illuminate the severe threat that the group known as the ‘Warlords of the Afflicted’ poses to any and all noble force or community. The members of this group, are all high-ranked criminals with extraordinary powers. Some of them seem to be the work of vengeful gods, whilst others seem to be gods in their own rights. But know this now. This book is not to help one to combat against these foes. This is a warning, to any fool brave enough to face them without proper preparation. This is the most silly of the Warlords. Crain’s story is unkown, but it is clear that he is nothing but a punching bag for the other Warlords....It is doubtful if he poses any threat at all to the Dawnlands. All Warlords....are extremely unstable. They all seek namely the same things: Power, Money, and Infamy. Except, for the Warlord named ‘Nadih’. Nadih was once a priest in a far off community. He was born and raised into a poor family of farmers and was sold into an ‘apprenticeship’ under a cruel, abusive priest. Nadih’s heart became consumed by hate and sought escape. His mind began to warp under the constant beatings, and he began to enjoy pain. He became cruel himself, inflicting pain whenever he could. He began to crave to feel the pain he inflicted on others. Through experimentation with dark tomes he acquired through questionable means, he discovered a very twisted ritual, that would allow him to feel all the pain he made his victims feel. And thus did Nadih become a Warlord of the Afflicted. Kathail Fiveheart is a warrior of great strength, and advanced arcane knowledge. He used demonic-magics to steal the hearts of four renown warriors of a far-off kingdom, and placed them into himself. The ritual prolonged Kathail’s life, and made it so that as long as he has even one heart he will continue to live. He uses his long-life span, to kill as many bounties as he can get his hands on. Kathail has a weakness for money. Kathail was on the run from a group of bounty-hunters. He was about to be defeated, when a masked figure appeared out of nowhere. It quickly struck down the mercenaries, and turned to Kathail. It called itself ‘The True Affliction’. It bade Kathail to journey to some mountains close by. Kathail journeyed there, and found a fortress. Thus, did Kathail become a Warlord of the Afflicted. Alstair Gregorvan was an elf that was born with a small amount of magical talent. He grew up envious of the town’s ‘protege’, an elf by the name of Tengard. He sought a way to finally best his ‘rival’. He became desperate and relentless in his search of power, and became consumed by the darker side of the arcane. He eventually heard tell of a rumored library by a small-beggar boy that had extraordinary power in it’s volumes. He searched for the evil-library, and found it in the possession of a mysterious guild. He immediately asked for access, and became a member. He was drawn to a section of body enhancements, and modified his body as much as he could... He now sports two mouths on his palms, that are known for firing explosive blasts of magic. In doing so, Alstair tied himself to the Afflicted. Thus was another Warlord of the Afflicted born. Farcnex is a mysterious halfling with unusual ablities. He is adept at creating golems of earth which he then connects to using magic, and controls them like they are puppets. Farcnex is so skilled at his art, that he is able to place himself inside his larger ‘puppets‘ and use them as enhanced armor for him to fight with. He used his talents to steal from all over the lands, and was eventually placed in a wooden prison. In his confinement, a strange plant-like being ‘grew‘ out of the wood and offered him freedom. Thus was another added to the ranks, of the Warlords of the Afflicted. Hardooc Bronzeblood was a champion of his orcish clan. He was so strong, that his people gave him the title of, “Mortal God”. He was a protector, taught that loyalty meant everything. His village sent him out to protect a negotiator that would talk to a neighboring Elven kingdom. But in his absence, this teacher betrayed the clan and allowed for a rival clan to wipe out Hardooc’s home. When Hardooc came back to his homeland, he found it soaked with blood and his friends all slain. Hardooc travelled to the rival-clan....and wiped them all out in a fit of rage. He slaughtered every male, female, and child. But, he saved his teacher for last. 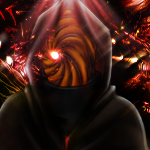 After his vengeance, Hardooc became lost without a family to protect or help...As he contemplated ending his life to see them once more, he was stopped by a cloaked figure wearing a mask. The figure offered Hardooc a new family, one that needed his help... Not wanting to be lost, Hardooc accepted. And thus was a God turned into a Warlord of the Afflicted. Eatachy was a master-illusioinist and combat-mage, even at the young age of eight. He could expertly weave illusioins to where they went by completely unnoticed, until it was to late. He was from an esteemed-family of magicians, but murdered his brother for more power. The last of his family, he became a wanted criminal for his crime. He journeyed the lands, in hiding from the law. He was traveling through a capital, when something flared in his highly-tuned senses. Someone nearby was using an illusion. He found a small boy, assassinating a noble. He questioned the boy, and was surprised by the skill he used, when he attacked Eatachy with illusions. Intrigued, he questioned further, and learned of the Afflicted. Eatachy decided to better his skill, and so asked the boy on how to join the Afflicted. Thus was an illusionist blinded, and another warrior added to the ranks of the Warlords of the Afflicted. Besan is an example of a being who has almost no humanity left. He is an off-white color with vibrant green hair, and yellow eyes. Instead of the normal Afflicted-cloak, he has large green-growths that resemble clothing. They look and feel like flora. His background is unknown, but the first time he was ever seen was at the founding of the Afflicted. He is one of the oldest members, and is known for being the a top-notch spy. His abilities make him untraceable as well as unseeable. Ilithin is an orphan that grew up in the streets of the Kingdom, Rainfeal. She was friends with the noble-child Salthen- who later became Saltheian Soulborn. Salthen sought to change the ‘corrupted world, and Ilithin fell for her childhood friend. She mastered the art of combat seals and helped Salthen in his rebellion. One day Salthen unleashed a priorly unknown power inside himself, and overthrew the King of Rainfeal. Her lover became the ‘God‘ of Rainfeal, and she his ‘Angel’. When their Kingdom became threatened by the surrounding-warring nations, Saltheian began to look for a way to protect their country. One day, a mysterious figure materialized out of the air, and offered them a chance to protect what was theirs, and to stop the cycle of war in the world. Ilithin followed her lover into service, and became a member of The Afflicted. Thus did love become a Warlord of the Afflicted. created chains of hatred and discontent. He decided to unleash his rage, and started a rebellion against the Kingdom. With his now lover, Ilithin, at his side, he quickly became a threat to the King of Rainfeal. One night, a figure appeared in his dreams....It spoke of a secret-power that was a gift from his ancestors. When he awoke, he discovered that he had a latent affinity for Gravity-Spells, and gained god-like stamina. With this in mind, he performed a dark ritual to augment his strength. Later, after he had become the ‘God‘ of Rainfeal... He was approached by the being in his dreams with an offer of even more power. When he accepted, he became a member of the Afflicted. Thus, was the WarMaster crowned to lead the Warlords of the Afflicted. A small boy of around eight to ten, that delivers all orders to the other Warlords. He has an apprenticeship under Saltheian, and is learning Dark-Magic. THESE are the Warlords of the Afflicted. This is the threat that has now resurfaced from the shadows of the past. They are back....and hungry for blood.